2. Using a pastry cutter, cut the cold butter into the flour, until the size of small peas. 6. Remove the dough from the refrigerator and roll it out, about 1/8" thick. Place dough into the pie plates (preferably springform ), reserving the leftover dough for the lattice top. Keep the prepared dough cold. 7. To prepare the filling, combine the chopped rhubarb, blueberries, orange zest and juice, granulated sugar, and corn starch in a bowl. 8. Spoon the filling into the pie crusts. Top with cut strips of pastry. 9. Whisk together the egg yolk and 1 Tbspn of heavy cream. Brush the egg wash lightly over the lattice crust. Sprinkle generously with turbinado sugar. 10. Bake for 400 degrees F for about 45 minutes. If the tops start to get brown, around 30 minutes, place a layer of foil over the pies and continue to bake until the rhubarb is cooked through. 11. Remove and let cool. Serve with a splash of heavy cream. The lighting is impeccable. You are so awesome. Sounds like some exciting travelling- Can't wait to hear about your thoughts on BlogHer food! That pie looks outstanding, you put it together beautifully! WOW! ah that looks so good, I want to dive right in it. Blueberry being less tart than strawberries would be perfect for rhubarb I think, although I've not eaten rhubarb before as it is difficult to get it here in Singapore. Glad you had fun contributing at BlogHerFood, wish I live in a country where the food blogging community activates this sort of thing. You said something in your presentation which got tweeted and retweeted and I liked it. I'm learning to discover darkness and found it amazing in food photography. Keep rocking! Your pies are so beautiful! I love how neat and perfect the lattice topping is. And the flavors... Yum! I just pinned this! So making it after a trip to the farmer's market this weekend! 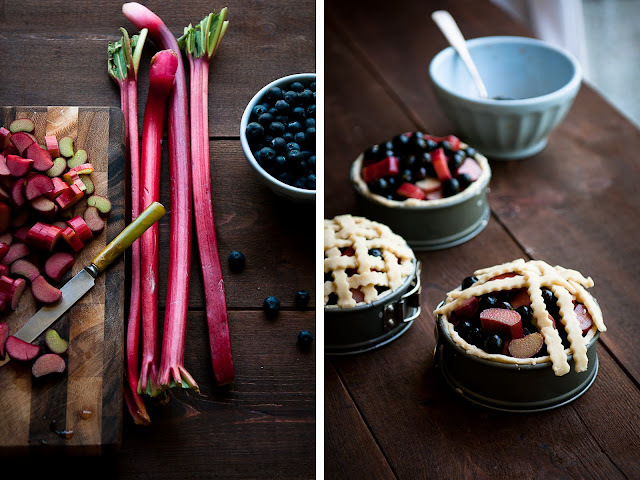 The recipe, the photography, blueberry + rhubarb, oh my. Your photography IS art. I could frame these pics! These individual deep dish pies are lovely! At first I thought they were full size... and I saw that fork and thought, "Yeah, I could probably devour that whole thing" But that would be quite indulgent... though totally worth it. Holy cow. This is beautiful! So great to meet you at BlogHer and I'm so excited to catch up on your blog! Hope to see you soon. I'll keep you posted on my successes (hopefully) photographing jam. I so need this tonight! 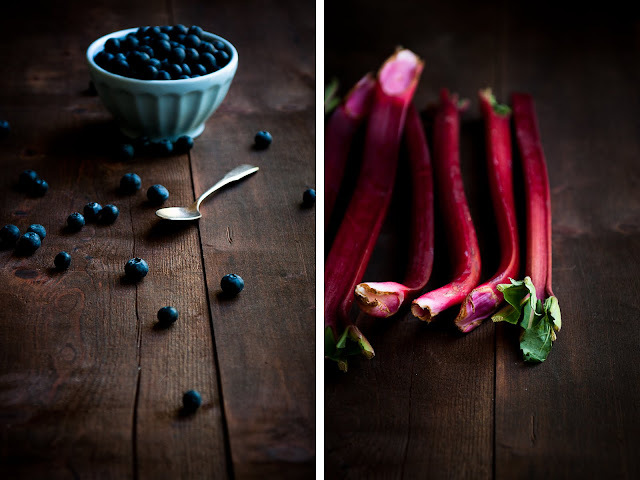 Blueberry and rhubarb sound like a wonderful combination. I also love the mini springform pans. I must find a set of those. Sounds like you've had some great travels! This pie looks amazing, can't wait to try it! Thoroughly enjoyed hearing your presentation in Atlanta. I think I was wedged into a corner somewhere, but was happy to be in the room! Your photographs are special -- the soft light in a dark environment is stunning. Best to you as you shake off the layers of travel fatigue you must be wearing. Thank you so much, everyone! For those of you at BlogHerFood who I met, I very much enjoyed meeting y'all, and for those of you who I didn't meet or who didn't make it, I hope to run into you sometime soon. @Danielle: omg, I am so going to trademark bluebarbberry now. It *would* make a very cute bakery name. @Lori @Girl Meets Oven: You can find the springforms on amazon--see link in the post. I did a granola tart shell awhile back but I'm not giving you the link because your photos make me weep. I sincerely want crawl inside the shot of the pie with the cream dribble. Please say something nice about blogherfood. If I read another negative post I'm going to lose it. Yawn. your photos are ABSOLUTELY STUNNING!!!!!!!!!!!!!! 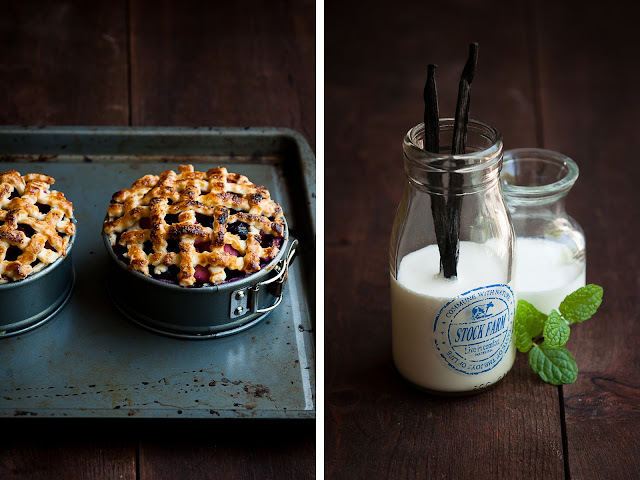 Delicious pictures...and that pie looks just as delicious. If my rhubarb does well, I'll try this. I made one of your recipes, it turned out delicious. I never would have thought to use those mini springforms for deep dish pies. You're so freaking smart! Same thing about mixing blueberries and rhubarb. I'll have to try it! Stephanie, it was so great to meet you yesterday. Such a pleasure, I see exactly what you were talking about with your styling. Love your photos can't wait to read more. Your photos are SO AMAZING. You are so talented! Love the pictures!! Looks so delish!! Looks like a basket of heaven. Definitely tempting. I wish I could have a small piece of it ! am now obsessed with your blog. just from the title! not much of a cook or baker but i LOVE your food photography SO much that I want to try my hand at so many yummy things featured here. Who could resist this sweet little temptation? It looks mouthwatering. Just lovely and I am sure it taste wonderful. Thank you for sharing this. i love, love, love the idea of baking a pie in a springform pan to make it deep dish. I'm going to try a blackberry pie this way tomorrow. Your pies turned out beautifully!